An interesting book about the detail which guarded Saddam Hussein following his capture by the U.S. Army in Iraq. Young MPs, they did not see the brutal dictator of Iraq but rather an old man who wrote poetry and liked to smoke cigars. It is well-written and interesting, but it never talks about the infamous photo of Saddam in his underwear. Did one of the "Super Twelve" take this picture? If so, what happened to this person? 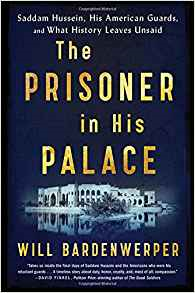 One thing this book confirmed for me was the location of Saddam's incarceration at Camp Victory. I would run most days when I was there in 2005 and when going by the small lake I noticed a building on its own island with extra security. Unlike other buildings it had no sign for the unit occupying it or its function. I mentally tagged it as a possible location for Saddam.